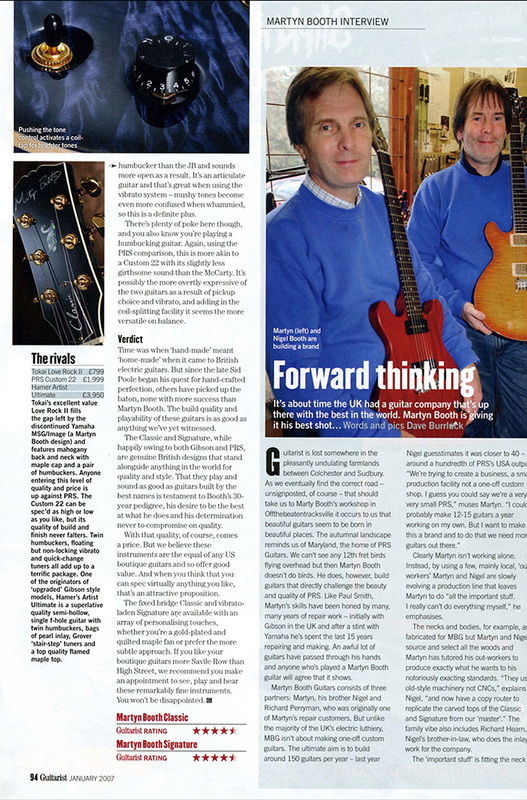 Anyone who’s kept an eye on the comings and goings within the music instrument industry over the last few decades will know that Martyn Booth worked for Gibson’s UK repair department during the 1970’s. From there he went on to run his own successful repair business before desiging the MSG range of guitars for Yamaha in the mid-eighties. There he created the MSG (later Image) guitar, looking to combine the elegance of a 335 with the construction of a Les Paul. Although it got a great response – the late great Alan Murphy was the model’s prime champion – by the early nineties times were tough and Yamaha decided to cease production. Come forward 10 years and Martyn has a successful repair operation in Suffolk, where his reputation as a craftsman and perfectionist keeps him busy looking alter his roster of satisfied clients. But the nagging desire – along with considerable pressure from MSG/Image fans – to re-create and refine his original design to the boutique standards of PRS and co, has led to the models we see today. Those who have tried to amend an existing and extremely well-known guitar shape will know that it’s infinitely more difficult than you think. In this instance, Martyn couldn’t just scale the ES335’s shape down by reducing its perimeter by a few millimetres because, where the body itself may have looked okay, the cutaways would have been way out of proportion. The reality is that every facet of the design – including body depth, waist and the carving of the top – all need to be adjusted in order to produce a look that ‘works’. Martyn has got things dead right. It’s hard to look at the Classic and not think it fell off a Gibson drawing board 50 years ago, whereas in reality it’s a completely new design in its own right. 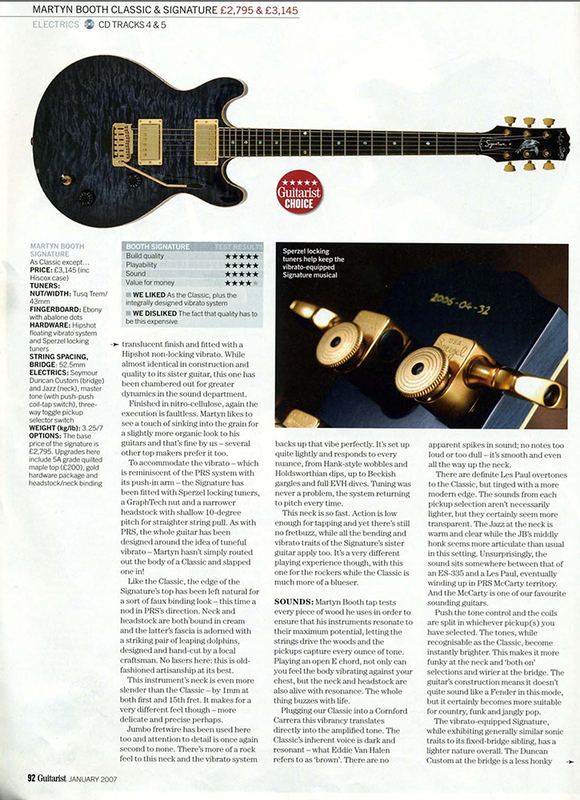 While Booth’s guitars ape the Les Paul’s construction with its mahogany back and maple-cap, Martyn has found that the correct proportion of mahogany to maple is vital to retain the proper balance of dynamics and sustain – too much maple and the sound can become brittle, go too heavy on the mahogany and It gets a bit too dark and grungy. Martyn keeps his wood stocks in batches according to weight (mahogany) and grain (maple), so customers can choose heavy, medium or light, along with whatever style of grain pattern they fancy – from fabulous quilts and flames, to plainer versions for those not keen on the “furniture guitar” thing. All though most of Martyn’s guitars are chosen with transluscent finishes that highlight the grain of the maple top, we opted for this black Classic because we felt that, with its bound ebony fingerboard and pearl inlays, it leant a meaner, more rock ‘n’ roll look. The mahogany neck is glued to the body at around the 20th fret for virtually unhindered access to the generous cutaways. Neck and headstock are both bound in grained cream ivoroid while the ebony headstock veneer plays host to a custom design “swan” inlay in pearl and abalone, as well as the Martyn Booth logo in the latter shell. It’s a good looking headstock too, its double cleft design a deferential tip of the hat in Gibson’s direction. Hardware-wise, Grover ‘kidney bean’ tuners, narrow Gotoh tune-o-matic bridge and tailpiece, plus oversized strap buttons is all you get. Pickups are Seymour Duncan – a JB at the bridge and Jazz at the neck – looked after by single volume and tone pots and the usual three-way selector. Exlra sonic versatility comes from a push-push coil splitter on the tone knob for funkier, or perhaps more Fender-ish, tones. Looking for finish or construction faults is a fool’s quest, as the Classic is literally perfect from top to toe. in this case the finish is nitro-cellulose over urethane, but generally just the former is preferred. A large belly cut provides a snug guitar-to-body fit, and the instruments size means it snuggles into the player ready for action. Weight is enough to give the feeling of substance and this, allied to the guitar’s relative small size, lends an air of quality and purpose. Martyn favours slim necks with a minimum of taper. So at the first fret the Classic measures 21 mm, deepening to only 23mm at the 15th. Standard Gibson nut width means there’s plenty of room over the clean expanse or ebony and, with then neck joining the body at its antepenultimate fret, access is all but total. Booth’s years of setting up guitars really shows. He frets each instrument by hand in the old-fashioned way. They are then dressed and levelled, each one re-crowned and its ends carefully shaped and polished to leave absolutely no snagging. Strung with .009 gauge strings the action is slick and slithery. Bending on the large Dunlop 6100 frets is effortless and vibrato smooth, wide and easy to apply – in fact those who find the bend-and-vibrato technique a problem would do well to try one of Martyn’s guitars. The perfect fret job means that notes ring clear all over the neck and sustain is prolonged due to lack of any buzz or choking problems. The ebony board is a delight to play on, while the almost non-existent increase in depth along the neck’s length allows feel to be maintained wherever you play. Once you pick this guitar up, it’s hard to put it down. 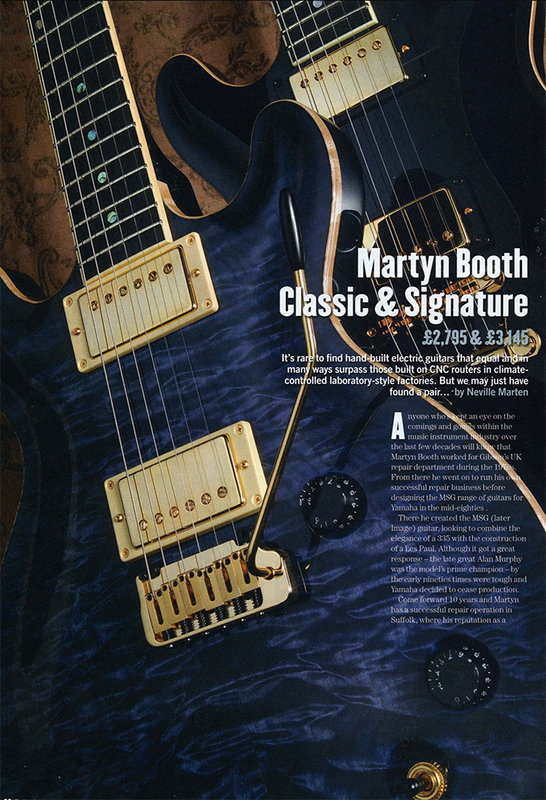 This is perhaps more like the guitars for which Martyn Booth is best known, with its 5A quilted maple top under a transluscent finish and fitted with a Hipshot non-locking vibrato. While almost identical in construction and quality to its sister guitar, this one has been chambered out for greater dynamics in the sound department. Finished in nitro-cellulose, again the execution is faultless. Martyn likes to see a touch of sinking into the grain for a slightly more organic look to his guitars and that’s fine by us – several other top makers prefer it too. To accommodate the vibrato – which is reminiscent of the PRS system with its push-in arm – the Signature has been fitted with Sperzel locking tuners, a GraphTech nut and narrower headstock with shallow 10-degree pitch for straighter string pull. As with PRS, the whole guitar has been designed around the idea of tuneful vibrato – Martyn hasn’t simply routed out the body of a Classic and slapped one in! Like the Classic, the edge of the Signature’s top has been left natural for a sort of faux binding look – this time a nod in PRS’s direction. Neck and headstock are both bound in cream and the latter’s fascia is adorned with a striking pair of leaping dolphins, designed and hand-cut by a local craftsman. No lasers here: this is old fashioned artisanship at its best. This instrument’s neck is even more slender than the Classic by 1mm at both first and 15th fret. It makes for a very different feel though – more delicate and precise perhaps. Jumbo fretwire has been used here too and attention to detail is again second to none. There’s more of a rock feel to this neck and the vibrato system backs up that vibe perfectly. It’s set up quite tightly and responds to every nuance, from Hank-style wobbles and Holdsworthian dips, up to Beckish gargles and full EVH dives. Tuning was never a problem, the system returning to pitch every time. This neck is so fast. Action is low enough for tapping and yet there’s still no fretbuzz, while all the bending and vibrato traits of the Signature’s sister guitar apply too. It’s a very different playing experience though, with this one for the rockers while the Classic is much more of a blueser. Martyn Booth tap tests every piece of wood he uses in order to ensure that his instruments resonate to their maximum potential, letting the strings drive the woods and the pickups capture every ounce of tone. Playing an open E chord, not only can you feel the body vibrating against your chest, but the neck and headstock are also alive with resonance. The whole thing buzzes with life. Plugging our Classic into a Cornford Carrera the vibrancy translates directly into amplified tone. The Classic’s inherent voice is dark and resonant – what Eddie Van Halen refers to as ‘brown’. There are no apparent spikes in sound; no notes too loud or too dull – it’s smooth and even all the way up the neck. There are definite Les Paul overtones to the Classic, but tinged with a more modern edge. The sounds from each pickup selection aren’t necessarily lighter, but they certainly seem more transparent. The Jazz at the neck is warm and clear while the JB’s middly honk seems more articulate than usual in this setting. Unsurprisingly, the sound sits somewhere between that of an ES-335 and a Les Paul, eventually winding up in PRS McCarty territory. And the McCarty is one of our favourite sounding guitars. Push the tone control and the coils are split in which ever pickup(s) you have selected. The tones, while recognisable as the Classic become instantly brighter. This makes it more funky at the neck and ‘both on’ selections and wirier at the bridge. The guitar’s construction means it doesn’t quite sound like a Fender in this mode, but it certainly beomes more suitable for country, folk and jangly pop. The vibrato equipped Signature, while exhibiting generally similar sonic traits to its fixed-bridge sibling, has a lighter nature overall. The Duncan Custom at the bridge is a less honky humbucker than the JB and sounds more open as a result. It’s an articulate guitar and that’s great when using the vibrato system – mushy tones become even more confused when whammied, so this is a definite plus. There’s plenty or poke here though and you also know you’re playing a humbucking guitar. Again, using the PRS comparison, this is more akin to a Custom 22 with its slightly less girthsome sound than the McCarty. It ‘s possibly the more overtly expressive of the two guitars as a result or pickup choice and vibrato, and adding in the coil-splitting facility it seems the more versatile on balance. Time was when ‘hand-made’ meant ‘home-made’ when it came to British electric guitars. But since the late Sid Poole began his quest for hand-crafted perfection, others have picked up the baton, none with more success than Martyn Booth. The build quality and playability of these guitars is as good as anything we’ve yet witnessed. The Classic and Signature, while happily owing to both Gibson and PRS, are genuine British designs that stand alongside anything in the world for quality and style. That they play and sound as good as guitars built by the best names is testament to Booth’s 30-year pedigree, his desire to be the best at what he does and his determination never to compromise on quality. With that quality, of course, comes a price. But we believe these instruments are the equal of any US boutique guitars and so offer good value. And when you think that you can spec virtually anything you like, that’s an attractive proposition. The fixed bridge Classic and vibrato laden Signature are available with an array or personalising touches, whether you’re a gold-plated and quilted maple fan or prefer the more subtle approach. If you like your boutique guitars more Savile Row than High Street, we reccommend you make an appointment to see, play and hear these remarkably fine instruments. You won’t be disappointed. Gurtarist is lost somewhere in the pleasantly undulating farmlands between Colchester and Sudbury. As we eventually find the correct road – unsignposted, of course – that should take us to Marty Booth’s workshop in “Offthe beatentracksvllle” it occurs to us that beautiful guitars seem to be born In beautiful places. The autumnal landscape reminds us of Maryland, the home of PRS Guitars. We can’t see any 12th fret birds flying overhead but then Martyn Booth doesn’t do birds. He does, however, build guitars that directly challenge the beauty and quality of PRS. Like Paul Smith, Martyn’s skills have been honed by many, many years of repair work – initially with Gibson in the UK and after a stint with Yamaha he’s spent the last 15 years repairing and making. An awful lot of guitars have passed through his hands and anyone who’s played a Martyn Booth guitar will agree that it shows. Clearly Martyn isn’t working alone. Instead, by using a few, mainly local, ‘out-workers’ Martyn and Nigel are slowly evolving a production line that leaves Martyn to do “all the important stuff, I really can’t do everything myself,” he emphasises. The necks and bodies. for example, are fabricated for MBG but Martyn and Nigel source and select all the woods and Martyn has tutored his out-workers to produce exactly what he wants to his notoriously exacting standards. “They use old-style machinery not CNCs”, explains Nigel, “and now have a copy router to replicate the carved tops of the Classic and Signature from our ‘master’. The family vibe also includes Richard Hearn, Nigel’s brother-in-law, who does the inlay work for the company. The important stuff is fitting the neck to the body, hand-carvng the neck – with a traditional spoke shave – fretting the guitars and of course, all the final assembly and set-up after the guitars have been finished – again done out-of-house. “I wouldn’t let anyone near my guitars to do the neck shape, that’s me, my job,” says Martyn. If you’re thinking that this seemingly convoluted production method could compromise quality, Nigel is insistent that the reverse is the case. “The guitars are better now than they’ve ever been because Martyn is just so demanding in terms of quality and consistency. Each of the three guitars has a different geometry in terms of neck angle – the hard-tail Classic’s is slightly greater than the Vibrato-equipped Signature’s, for example. The Classic’s head is also slightly wider than the Signature, which needs straighter string pull over the nut because of the vibrato. For the same reason the headstock back-angle is less on the Signature compared to the Classic. 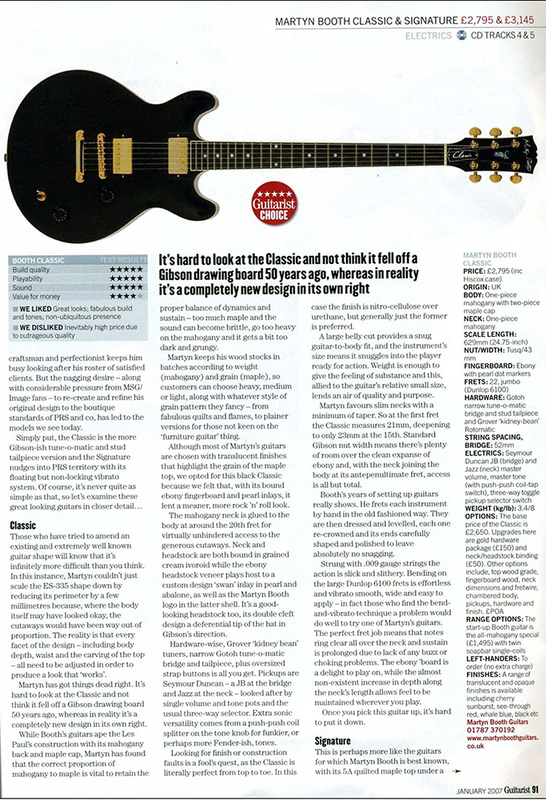 The Special’s head reflects the narrower geometry of Gibson’s student guitars like the Melody Maker. Currently the three-model range is built both to order and for stock as MBG is in discussion with a few key UK stores, including Hitchin’s Machinehead Music, to begin stocking examples – and serve as “demo centres” – as production slowly increases. 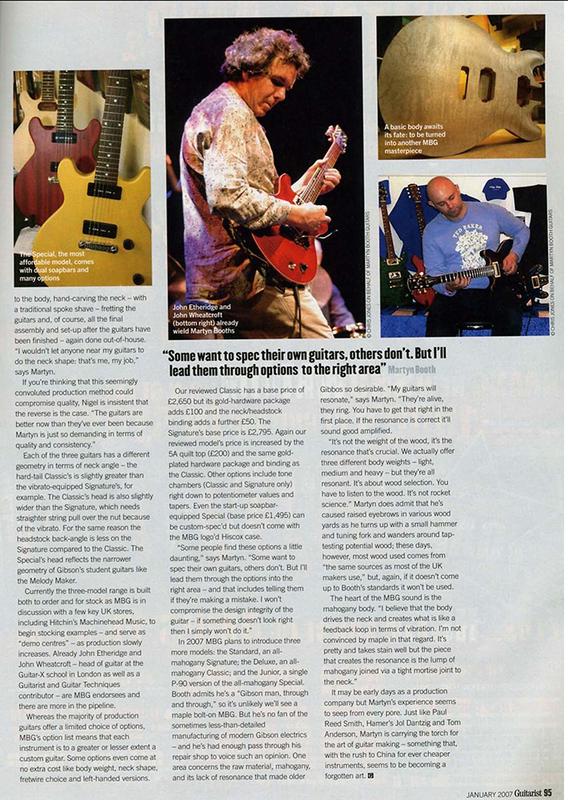 Already John Etheridge and John Wheatcroft – head of guitar at the Guitar-X school in London as well as a Guitarist and Guitar Techniques contributor- are MBG endorsees and there are more in the pipeline. Whereas the majority of production guitars offer a limited choice of options, MBG’s option list means that each instrument is to a greater or lesser extent a custom guitar. Some options even come at no extra cost like body weight, neck shape, fretwire choice and left-handed versions. Our reviewed Classic has a base price of £2,650 but its gold-hardware package adds £100 and the neck/headstock binding adds a further £50. The Signature’s base price is £2,795. Again our reviewed model’s price is increased by the 5A quilt top (£200) and the same gold-plated hardware package and binding as the Classic. Other options include tone chambers (Classic and Signature only) right down to potentiometer values and tapers. Even the start-up soapbar equipped Special (base price £1,495) can be custom-spec’d but doesn’t come with the MBG logo’d HISCOX case. In 2007 MBG plans to introduce three more models: The Standard, an all mahogany Classic; the Deluxe, an all mahogany Signature and the Junior, a single P-90 version of the all-mahogany Special. Booth admits he’s a Gibson man, through and through, so it’s unlikely we’ll see a maple bolt-on MBG. But he’s no fan of the sometimesless-than-detailed manufacturing of modern Gibson electrics – and he’s had enough pass through his repair shop to voice such an opinion. One area concerns the raw material, mahogany and its lack of resonance that made older Gibbos so desirable. “My guitars will resonate,” says Martyn. “They’re alive, they ring. You have to get that right in the first place. If the resonance is correct it’ll sound good amplified. “It’s not the weight of the wood, it’s the resonance that’s crucial. We actually offer three different body weights – light, medium and heavy – but they’re all resonant. It’s about wood selection. You have to listen to the wood. It’s not rocket science.” Martyn does admit that he’s caused raised eyebrows in various wood yards as he turns up with a small hammer and tuning fork and wanders around tap testing potential wood; these days, however, most wood used comes from “the same sources as most of the UK makers use”, but, again, if it doesn’t come up to Booth’s standards it won’t be used. It may be early days as a production company but Martyn’s experience seems to seep from every pore. Just like Paul Reed Smith, Hamer’s Jol Dantzig and Tom Anderson, Martyn is carrying the torch for the art of guitar making – something that, with the rush to China for ever cheaper instruments. seems to be becoming a forgotten art. “Some want to spec their own guitars, others don’t. But I’ll lead them through the options to the right area.